Der Spiegel on Dec. 19 was forced to write an expose on its own journalist and editor, Claas Relotius. The weekly publication admitted he had committed deception “intentionally, methodically, and with criminal intent,” affecting at least 14 of his 60 articles. Relotius was just 28 when he won CNN’s Journalist of the Year in 2014, for a feature about the U.S. prison system (he didn’t work for CNN and never had anything published on CNN platforms). He went on to win several more awards, including for stories now revealed as forgeries. Some of the fakes are about the United States, including topics such as the U.S. detention facility at Guantanamo Bay, executions, “Trump’s America,” and most recently, a piece on U.S.-Mexico border vigilantes. The article, published in Der Spiegel in 2017, included a description of a sign at the city limits that read, “Mexicans Keep Out.” But, like some of the people who featured in the story, the sign didn’t exist. Relotius, 33, ignored the complaints from the people of Fergus Falls. He finally was caught this fall, when fellow reporter Juan Moreno turned undercover investigator after suspecting that Relotius made up quotes for a co-written feature on vigilantes on the U.S.-Mexico border called “Jaeger’s Border.” Moreno headed back out on assignment with Relotius with a special assignment of his own: to gather evidence. Things began to unravel for Relotius on Dec. 3, just 17 hours before he scooped up a 2018 reporting prize for an article on a Syrian boy he claimed had been central to events that lit the conflict in the region. That’s one of the pieces he admitted to faking. A spokesperson for the vigilante group had sent an email questioning his reporting on “Jaeger’s Border,” prompting Moreno to come forward with his evidence. Relotius initially denied the allegations, then tried to undermine Moreno’s credibility. “Relotius finally confessed at the end of last week,” Der Spiegel said on Dec. 19. “It has emerged that he invented entire passages—not only in the article ‘Jaeger’s Border,’ but also in a number of other articles. 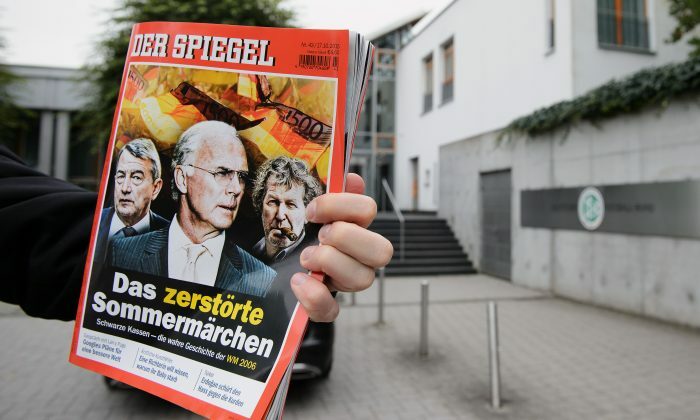 Der Spiegel is home to one of the largest fact-checking departments in the world. According to Der Spiegel’s own analysis, Relotius gamed the fact-checking system to not only hide his fakery, but to also bolster the authenticity of his reports. Some American political and media commentators compared the case to the 2003 revelations about New York Times reporter Jason Blair, who was caught fabricating comments and scenes and lifting material from other newspapers. Relotius has already been stripped of the Peter Scholl-Latour Prize 2018.